This sassy little number was made using my Envelope Punch Board. I've used the board far more for cards and boxes than for envelopes. The first photo shows the sleeve which is hand-scored and embellished with patterned paper, washi tape, ribbon and a label. 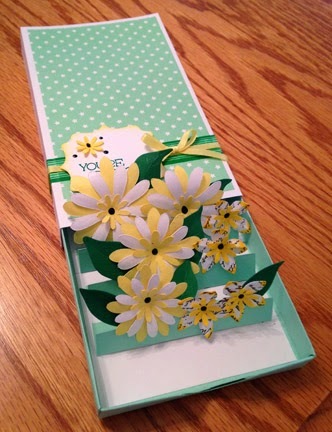 The second photo shows how the flowers pop up when the box is opened and there's room for a gift card behind the flowers. 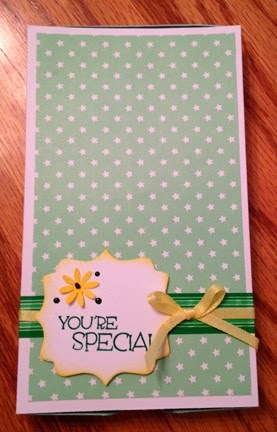 I'm not sure I'd put this in the mail but it's good for handing to someone on a special occasion. And, of course, all kinds of other things can pop up--like stars and balloons and . . . .